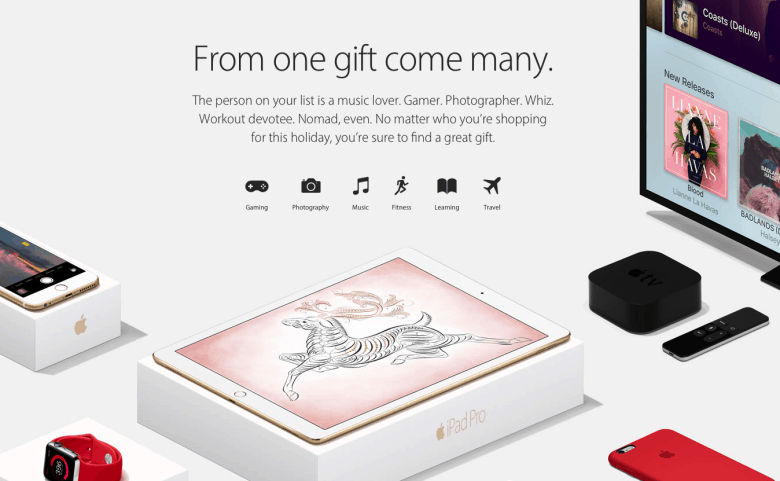 Apple’s holiday gift guide is helpfully broke down into gaming, photography, music, fitness, learning, and travel categories — meaning that the guide has something for just about everyone. It features a lot of the official products you’d expect Apple to tout for the holidays, including the new, fourth-gen Apple TV, iPad Pro, iPhone 6s, Apple Watch, Retina MacBook, etc. However, it also drops in a few things you may not have thought of — such as an Olloclip Active Lens or JOBY GripTight GorillaPod Video tripod for the photography lover in your life, or the Wahoo Fitness KICKR SNAP cycling trainer and Wahoo TICKR heart rate monitor for fitness buffs. You can check out the Apple gift guide here. And while we’re talking the holiday season, does anyone else have any great Apple-related gift suggestions they’re thinking of as we get closer to ushering in 2016?